1986 1200 SEI and Trigg Trike kit. 1993 'Black Beauty' 1500 SE and chair. + about 20 bikes from 1914 to current. It's some time now since I have used the Triggs kit, as most of my riding is now on the full trike (93 1500) I enjoy so much. But the Trigg kit was ok for what it is. I understand they have now improved the kit, adding a lot more ridgidity (spelling) to it, and this would improve it on corners. Very hard for me to give a total cost to me, as can't remember the exchange rate when I bought it, as well as there were considerable freight charges, import duties and taxes. But after riding the 93 full trike, my advice would be to sell what your wife currently has, and add the proceeds to the current cost of the Triggs kit, and take her shopping for a good second hand trike. Sorry I can't be of more help. Cheers. This is an interesting thread. Have it bookmarked. 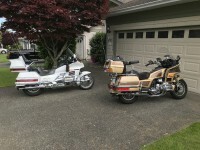 Wireguy51, I checked into this trike kit a few years back. They are sold by the company who makes them some where in Texas. I priced the kit for my bike which is an 85 Limited. The kit I looked at came with the reverse and painted to match my bike. All I would have to do is assemble and install it. The price to my door, including shipping, was only $5200. Which for me is way out of my price range. But at least I know that if the time does come that I need more than two wheels that there is something available. And who knows by the time that comes maybe I will be able to actually afford it. Lol! You can enter the name Trigg trike kit in your search engine box and start scrolling through the results. You will find the website and will be able to get all of your questions answered directly from the factory. I hope this helps. Take care and stay safe brother! I'm interested in the plan or instructions does anyone have them? I guess it isn't a real sticking point, just a different length for the arm of half an inch in any case. I think the stress on the lifting mechanism would be too great going over bumps. You are right. I seem to remember saying something along those lines. I did use 6 inch. Wouldn't want to go any bigger though. The purpose of the whole rig is to simply balance the bike while you push it around, or while you put the kick stand up and select low. When both feet are on the ground, the wheels should be up. If you need them for more then this, then you should consider a proper trike kit. The ideal safety device for this system would be to connect them electronically to the neutral switch. Only able to lower when in neutral, and automatically retract if a gear is selected. I like the idea of integrating with the neutral switch - I may give that a try !! I know the commercial unit slaved to the speedo and lowered the wheels when speed was under 5 KPh or something like that. I had the commercial unit and didn't like them. Found that whenever I pulled up for the lights, I automatically leaned a little to put my foot down, then the wheels would suddenly jolt me upright. Not enough control over when they were up or down. The minute you moved, they came up again, making it hard for manouvering around a petrol station. Was glad to get rid of them. Others might like them though, as our needs are all different. nice article. I also have had issues holding up these monsters and have gone down to Silverwings. cruisers..but always end up back on a Wing. I hand built 5 trikes from scratch in the 90s and 2000s for friends after building the first CX500 for the wife. the last hand built one was a 05 1800, I used same diffs on all. Toyota Corollas. narrowed the one side.axle,housing and all. hand built the trailing arms,used stock shocks to keep it simple as possible.used GM CV joints for driveshaft.i never for into the fibreglass bodys. tried,looked like poop. so just let the owners build little boxes on back. the only one I just bought ready to go was the blue 85 GL1200 with the third Lehman kit on it. Even installed a side car from a old URAL set up that was smashed . the last trike was a used Voyager kit that was on a big 1500 Cruiser I changed to fit the 96 1500 .I stopped riding 5 yrs ago when fell off roof and broke a few bones. just got a beautiful 1 owner 84 1200 last week for $500 . 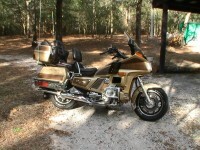 might build my last trike kit on it this winter. You sir are a craftsman ! I think you have the skill set, just need all the tools to go along with the project. thanks..no no craftsman. my father taught us to weld and fix anything. I did same with my sons. now they help me due to my stroke and dementia starting. do it while u can guys,we don't grow old gracefully. I will be 65 in December. my father made it to 66. my grandfather 63. so far so good ? bad part is my shop burned down 5 yrs ago and I have nothing left to build with.Insurance paid me $1500 for 50 yrs worth of tools and paid $20,000 for the shop. local contractors wanted $60,000 to rebuild it.so I scrounged the materials and wife and I builit it ourselves for less than $15,000,i fell off ladder finishing the roof. never walked for a yr. now im walking and riding again.heres a few pics .I had just bought a 2000 GL1500 3 weeks before. didn't have fire insurance on it.? but a friend had his 08 F150 in there that he paid $4500 for at a Auction and insurance paid him $17,500 for it ? and I got squat for the 1500. I did ok on our travel trailer, we paid $4500 for it at a Auction and got $12,000 for it. I put all my steel tools in a cement mixer with sand and cleaned em up a bit. still use them today. my 5 snap on boxes all melted but dads homebuilt toolbox survived.is repainted and son uses it today.my 05 Yamaha quad melted and I got $4500 for it. my 93 Polaris snowmobile melted and got $2500 for it.my tire machine survived.repainted it and use it today.i got third degree burns on back and face trying to rescue the Gold Wing, its running today too. friend bought it and made a rat bike out of it. The good part is that you are still with us. Can always replace things. Hear you on the growing old gracefully, but we do what we can. sold it in late 90s for a 1500 . Nice story. Had a few tumbles early on but nothing like yourself. Expertise is sometimes lacking today, but it's a different world. Have my '85 LTD FI apart for valve work, low compression. Lapping cleaned the seats and valves up nicely. While it's apart doing some wiring, looking into the idle air control system, and a few other maintenance issues. Never thought when I bought the bike 3 years ago the only item that I would not disassemble is the motor, been into everything else. Get a lot of satisfaction from working on the old girl and seeing it improve each time. Do a defined work period then ride for a while, then another. Luckily have a 1500 to ride in the meantime. just order a poorboy kit from Don Piggott. I have put 2 of those on. can hardly tell its there.and puts out way more than stock stator.